Posted December 27th, 2013 by Ms. Jen & filed under art + photography. 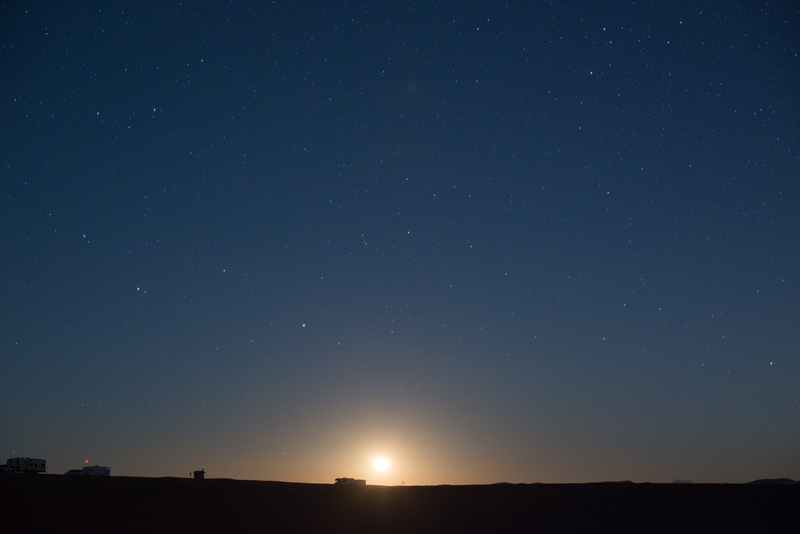 Sun 12.22.13 – Photo of the Moon rising over trailers at Glamis sand dunes Gecko Pad campground taken by Ms. Jen with her Nikon D800 with a Nikon 50mm f/1.4G lens at 9:54pm. Double click on image for lightbox. Posted December 26th, 2013 by Ms. Jen & filed under art + photography, moleskine to mobile. 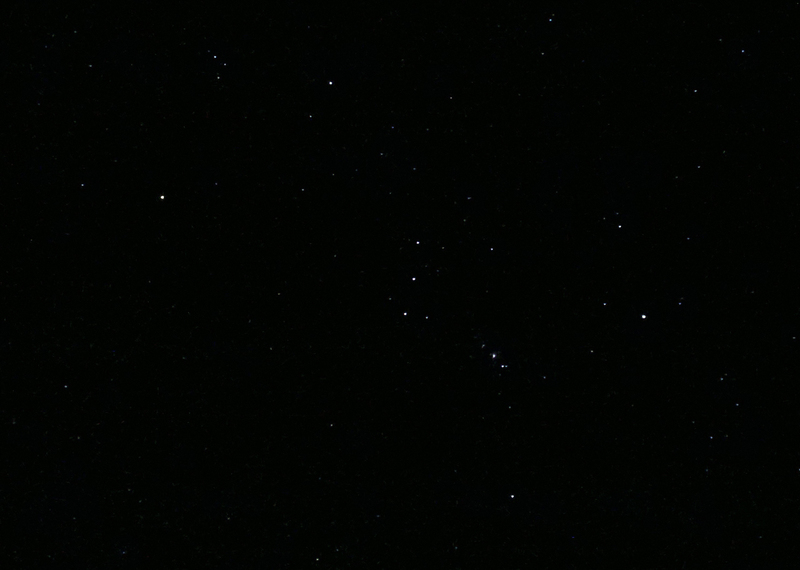 Photo of the Orion constellation taken by Ms. Jen with her Nokia Lumia 1020. Sun 12.22.13 – As most of the regular readers of this blog know, I am forever trying to push the boundaries of what a camera phone can do in terms of photography. I also want to capture the photo with my phone as it is, not as it could be with a lot of editing in Photoshop or Lightroom. My joy comes from taking the photos, not from the editing process. The Nokia Lumia 1020 has a great sensor and lens, very good low light processing software, as well as the Nokia Pro Cam app that allows one to set the exposure time / shutter speed to 4 seconds max and a max ISO of 4000. In the above cropped photo of Orion, I used a shutter speed of 4 seconds and an ISO of 3200 on a tripod. The only editing is the addition of metadata and cropping the photo to focus on Orion. The full un-cropped photo is up at Flickr, and if you and I follow each other on Flickr you can see the original huge photo here (7712 x 4352 pixels). Posted December 23rd, 2013 by Ms. Jen & filed under art + photography, nature + environment, oh, california. Photo taken by Ms. Jen at Glamis Sand Dunes Campground Pad 2.5 with her Nikon D800 and Nikon 50mm 1.4G lens. Sun 12.22.13 – In my endeavor to see and photograph dark skies at least once a quarter, thus in the last 31 hours I took a trip down to the far part of south-eastern California in the Imperial Valley near Brawley to photograph the night sky from 7-9pm before the moon rose. Yes, folks, I went to the famed sand sports playground, the Glamis sand dunes with its accompanied cult of Bacchus and Gasoline, to take astro photos. It was well worth it. It was even worth the darned drunks from The Point Camp bugging me while I was trying to take this wide field photo of the Andromeda Galaxy and the Milky Way with my Nikon D800 and a nifty fifty Nikon 50mm 1.4G lens with no special astrophotography equipment or mounts. I was racing against time, as the moon was rising and the sky was about to be filled with more light than would allow me to photograph such gems as the Andromeda Galaxy (just below center), the Triangulum Galaxy (top left), C28, and the Perseus Double Cluster (above top right). The sky was so dark and full of stars that is was near impossible to pick out the constellations at the zenith. And the Dark Sky folks label Glamis as a “Blue” “Rural sky” – due to the lights of Brawley, El Centro, Mexicali, and Blythe nearby. Amazing! 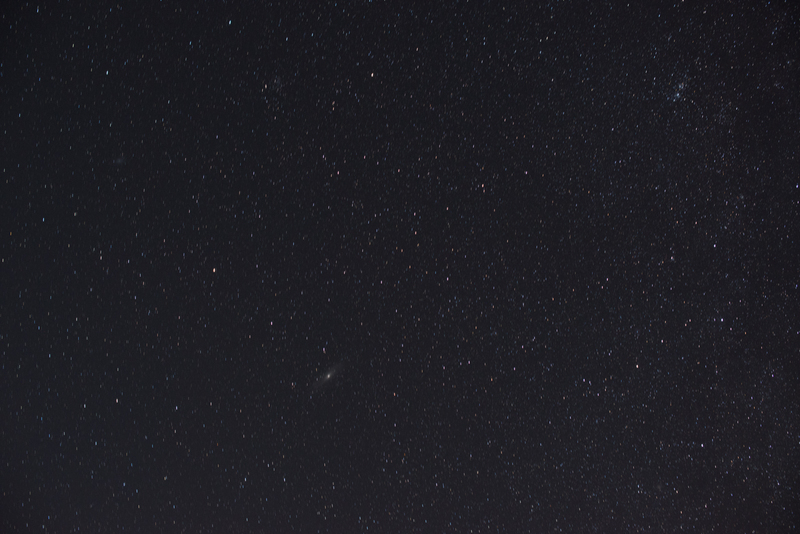 The Andromeda Galaxy was a faint, elongated blurry cotton ball to the naked eye and looked like a Galaxy in my binoculars and through the Nikon lens. Posted December 22nd, 2013 by Ms. Jen & filed under fun stuff, oh, california. 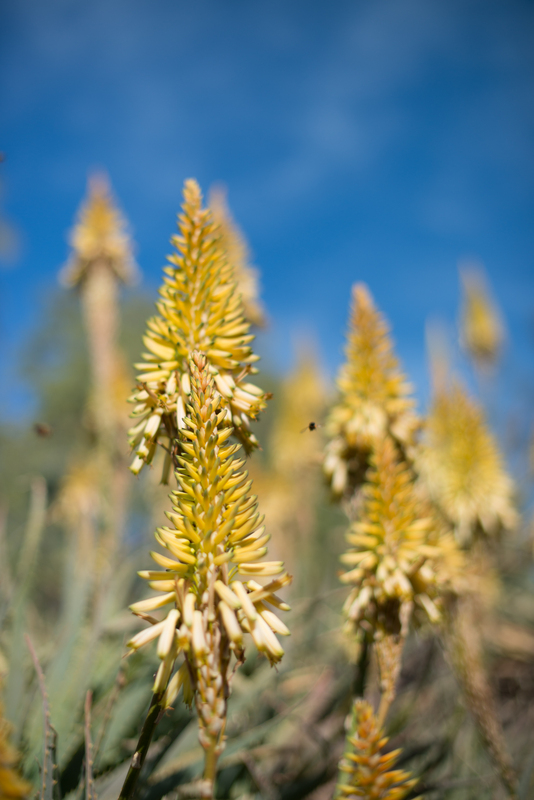 Photo taken by Ms. Jen last Sunday at the Huntington desert garden with her Nikon D800 and 50mm lens. 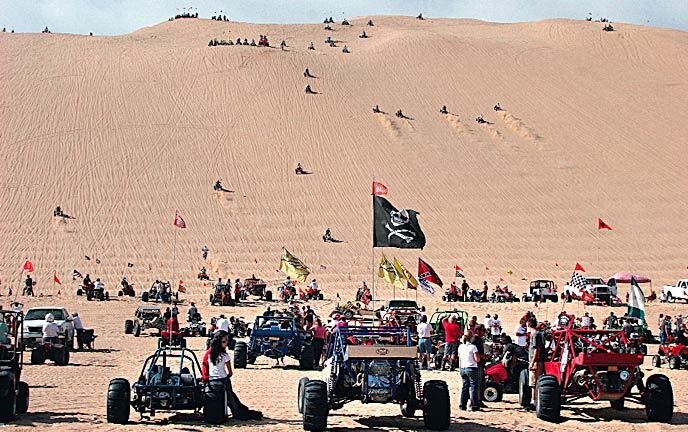 Sun 12.22.13 – I am off for 24 hours in Glamis to take photos and do some pretty darned dark sky star peeping – providing my brother will drive me out to darker skies in his sand rail. Yes, I have brought 3 pairs of ear plugs with me. Angry squirrel is defending his palm tree! His Tree! Not yours! Posted December 16th, 2013 by Ms. Jen & filed under fun stuff, nature + environment. 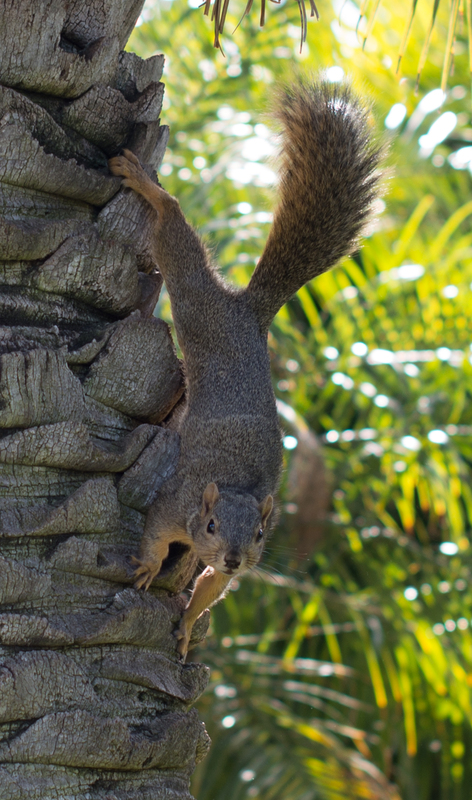 Mon 12.16.13 – Yesterday morning when I went on my photowalk at The Huntington’s gardens, this squirrel rumbled me. He made a great deal of noise, tail thumping, and evil glares to let me know that I WAS VIOLATING HIS TERRITORIAL BOUNDARIES. It was very funny and cute. Photo taken by Ms. Jen with her Nikon D800 and the Nikon 50mm 1.4G lens. Posted December 15th, 2013 by Ms. Jen & filed under nature + environment, oh, california. Sun 12.15.13 – I went up to the Huntington Library and Gardens early today for a much needed respite and photo wander around the gardens. 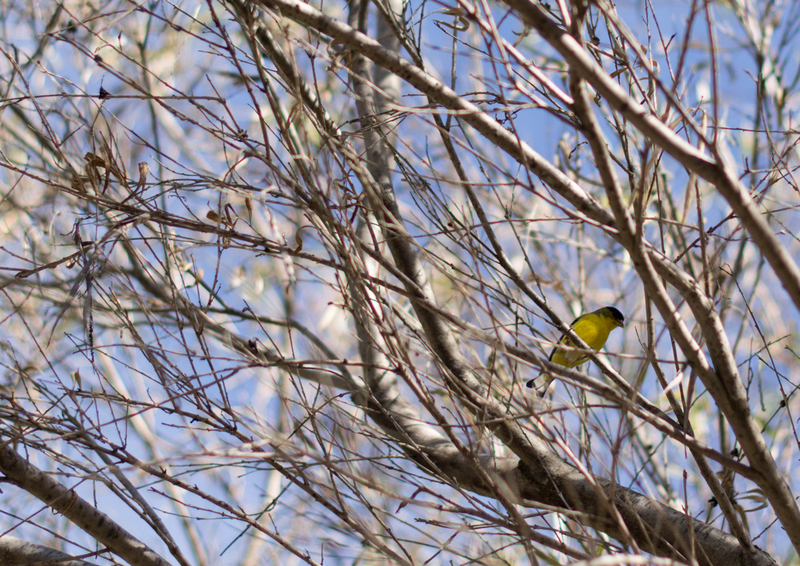 Upon hearing the distinctive goldfinch song, I looked up into a nearby tree and saw a pair of Lesser Goldfinches rubbing their beaks on the branches. They were lovely. I am glad that the goldfinches are back for the winter. Posted December 2nd, 2013 by Ms. Jen & filed under fun stuff, nature + environment. I love a well written obituary, one that not only sums up the life lived but also gives a glimpse into the real or imagined personhood of the deceased.